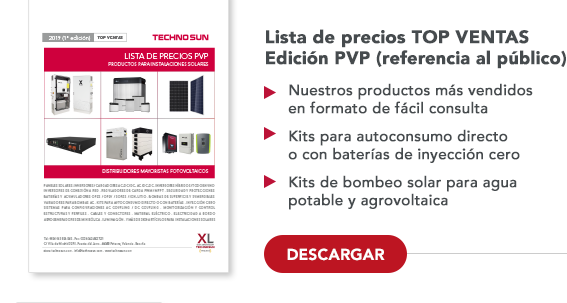 At Techno Sun we have updated our solar price list with the latest developments in our products for photovoltaic installations. You can download it and see the new products below. rIn our price list for photovoltaic solar energy products TOP VENTAS (PVP edition) you have the best professional products, with reference prices to the public. You have everything you need for your PV solar installations, from separate components to solution kits for direct self-consumption, with batteries or isolated. As a professional Techno Sun provides you with a price-list that allows professionals to manage competitive costs with premium brands and high performance products. 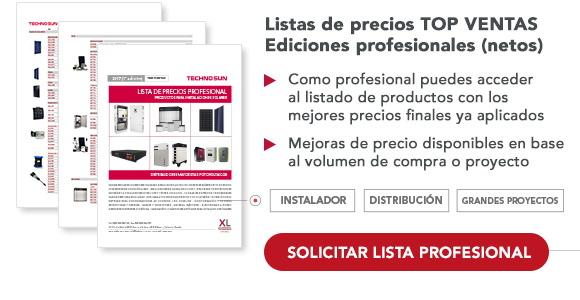 In addition it is possible to benefit from additional improvements for the purchase by volume or recurrent for installers, engineers, distributors and specialized stores. It is possible to obtain the list by contacting us at [email protected] or through our contact chanels. Solax Power’s high voltage Triple Power Battery is the optimal solution for compact and intelligent self-consumption solutions. The available models are: SolaX Triple Power T45(4.5kWh) and SolaX Triple Power T63 (6.3kWh), and up to 4 units can be used in series, with the same BMS T-BAT MC0500 unit allowing them to reach up to 25.2kWh of energy. They are suitable for both self-consumption and off-grid installations. At Techno Sun we have both Triple Power and BMU batteries as well as a range of three-phase hybrid inverters compatible with Solax Power X1-Hybrid and X3-Hybrid high voltage. The new 13.1kWh RESU13 solar lithium battery represents a new milestone in the RESU range of lithium batteries for isolated or self-consumption. With 13.1kWh, and a DOD discharge capacity of 95%, RESU13 allows up to 12.4kWh to be used. This capacity, combined with the quality and compact design of LG RESU batteries, results in a high-capacity, high-performance battery. Thanks to its cut cell technology, the polycrystalline solar panel RED SOLAR RED330-144P reduces power losses compared to a conventional panel thanks to its double busbar of shorter circuits. In addition, its excellent behavior with partial shadows avoids losing the entire production. 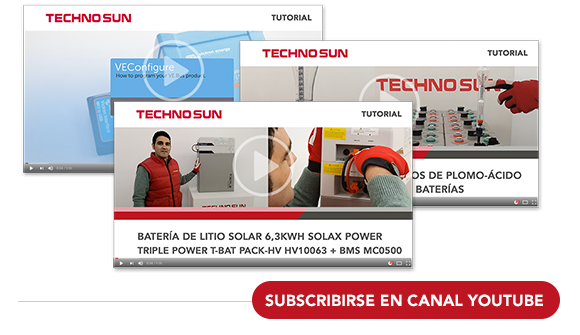 Don’t miss out on the latest product news, such as the unboxing and video connection of the Solax Power Triple Power Battery. There are also tutorials on how to measure the electrolyte in OPzS batteries or how to configure the Victron VE Configure from the internet.